Farmer Needs Assessment is necessary to understand what crops and livestock farmers have, and how they manage them. We work with farmers to help them to understand their constraints and to identify the inputs they need for increasing their crop and livestock productivity. We work with them to modify their existing practices. private sector farm input supply Companies. We have developed partnerships with 20 Seed Companies and 5 Fertilizer Companies in the Region. We believe that diversity is the key to food security. Farmers are simultaneously offered a choice of inputs and services to improve their most important crops and livestock in their farming systems. 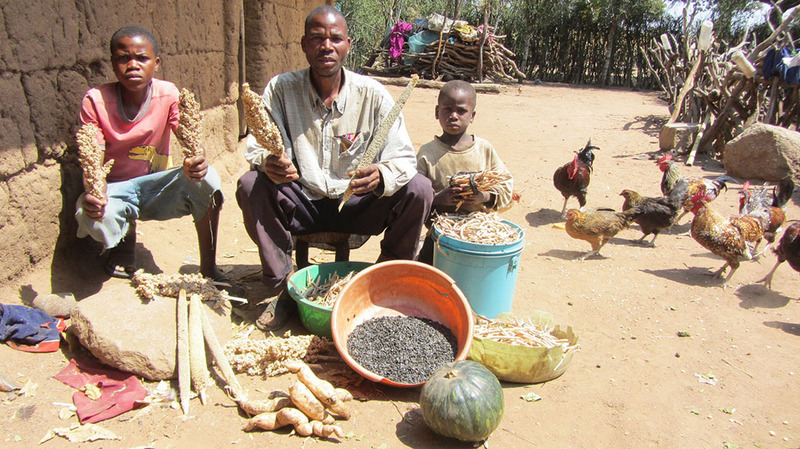 A Village-based Advisor in Singida district in Tanzania shows the range of inputs that he is promoting to improve the food security of farmers in his Village. Inputs include improved varieties of sorghum (Macia), cowpeas (Tumaini), pearl millet (Okoa), sunflower (Record), Sweet potatoes, pumpkins, and a thermo-stable Newcastle disease vaccine to protect indigenous chickens against the Newcastle disease. The “Farming System Improvement” component inherently recognizes differences in gender and wealth, and that not all resource-poor farmers are initially able to adopt expensive inputs. For example, while a farmer may not initially be able to afford expensive seed and fertilizer to grow maize, she may be able to vaccinate her chickens. After selling her chickens, she may be able to buy the seed and/or fertilizer. selected by, and therefore trusted by, farmers in their Villages. how to make money from input supply and related services. Most importantly, VBAs are able to generate enough income and are able to continue to offer their services to farmers after the end of a project. A Small Pack typically contains 25 -100 g seed of an improved crop variety. The Small Pack gives all farmers in a Village, whether they are male or female, or wealthy or poor, the opportunity to “Learn-by-doing” with a new variety on their own farms with little risk. The Small Pack is effective in creating demand for improved maize varieties, and farmers invariably return to the VBA to purchase larger quantities of seed. For self-pollinated and vegetatively-propagated crops, farmers multiply the seed to plant over larger areas to improve their food security.